Update: Production and importation of the original design GSG-5 ceased as of Oct, 8, 2009 with the signing of the agreement. The remaining inventory now in the USA can be sold by ATI, all distributors and dealers. ATI currently has GSG-5’s in stock. All sales of the GSG-5 by ATI must conclude by January 31, 2010. 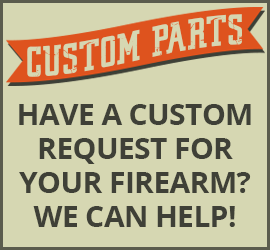 ATI will continue to service every firearm that it imports into the USA. The GSG 5 is an identical replication of the MP 5, except one great thing: It’s a 22 cal. Because of the low cost of ammunition the GSG 5 makes a perfect plinking rifle, training rifle or a serious varmint hunting rifle. Nothing of its kind has ever been introduced in the United States. The user will be impressed with its weight and performance. If you are a varmint hunter you will be encouraged by all the options the GSG-5 has to offer with its railing system, faux suppressor and easy change magazine. For training purposes, the GSG-5 is a low-cost alternative for Law Enforcement agencies and departments that use MP5’s in the field.